Fruit salad tossed with Noosa yoghurt is a delicious blend of six different kinds of fruit; cantaloupe, strawberries, grapes, blueberries, blackberries and canned pineapple. 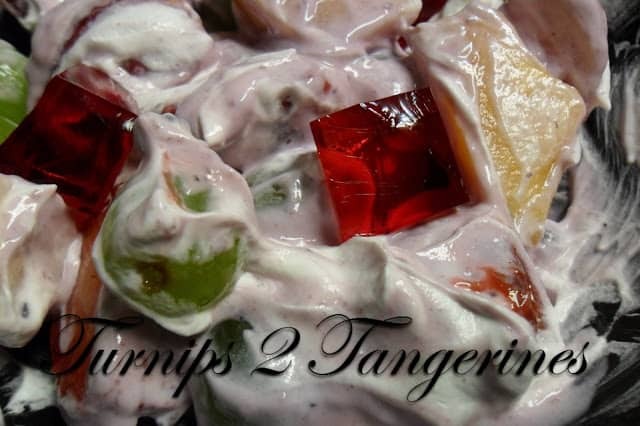 Cubes of jello are added per my grandsons suggestion and the fruit/jello combination is tossed together with a mixture of Noosa yoghurt and cool-whip free. If you aren’t able to find Noosa Yoghurt in your area, replace it with your favorite brand and/or flavor of yogurt. 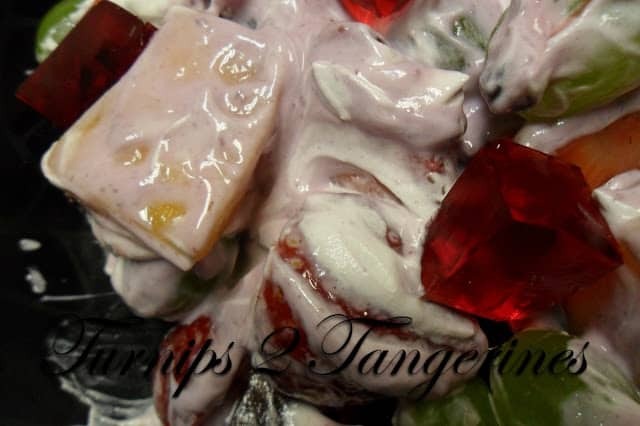 A refreshing fruit salad made with an assortment of fresh fruit, canned pineapple, and strawberry jell-o cubes. Everything is then tossed together with a delicious mixture of non-dairy whipped topping and Noosa blueberry yoghurt. I made this salad recently for my grandson while I was staying in Athens Georgia. My daughter was in the hospital giving birth to my first born granddaughter and my grandson wanted a snack. We both loved this salad. 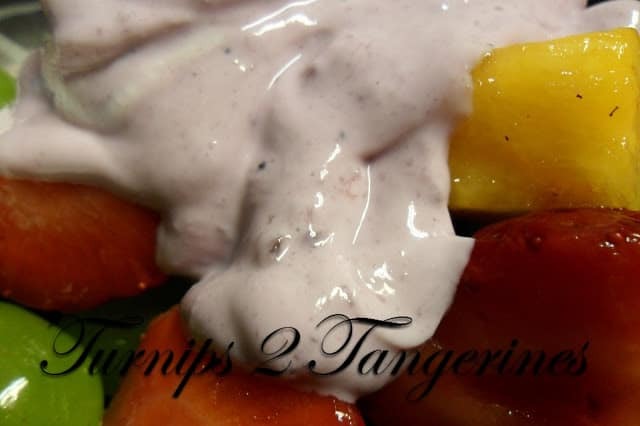 A delicious fruit salad tossed lightly with Noosa yoghurt and non-dairy whipped topping. Make jello according to package directions. Pour jello into a 8 x 8 glass baking dish. Chill until set. Cut jello into cubes, set aside. In large bowl, combine melon chunks, strawberries, grapes, blueberries, blackberries and pineapple chunks. 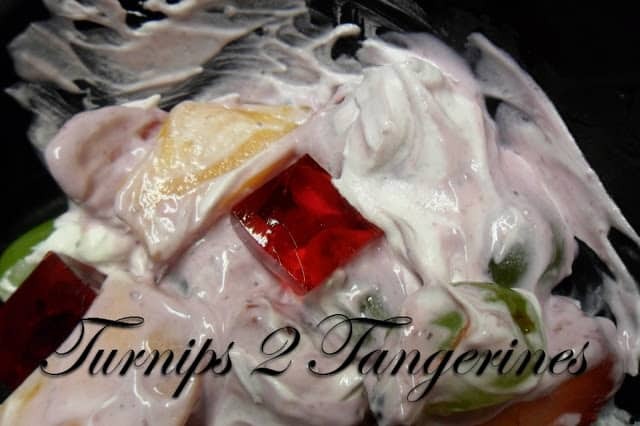 In a small bowl fold together yogurt and cool-whip, pour over fruit. Lightly fold in cubed jello. Coney Island Sauce Wisconsin Style . Coney island sauce is a super delicious sauce that is perfect to top grilled hot dogs or a yummy Wisconsin grilled brat. Made in the traditional Coney Island way but with a Wisconsin-style twist. It’s made with beer! We all loooooooove fruit salad, and your is so colorful….. I'm on such a fruit salad kick right now! Blueberries and blackberries are my favorites. Thank you for sharing with See Ya in the Gumbo this week, Lynn! I love Noosa yogurt! It is the best, a bit expensive, but the best. This recipe looks great!